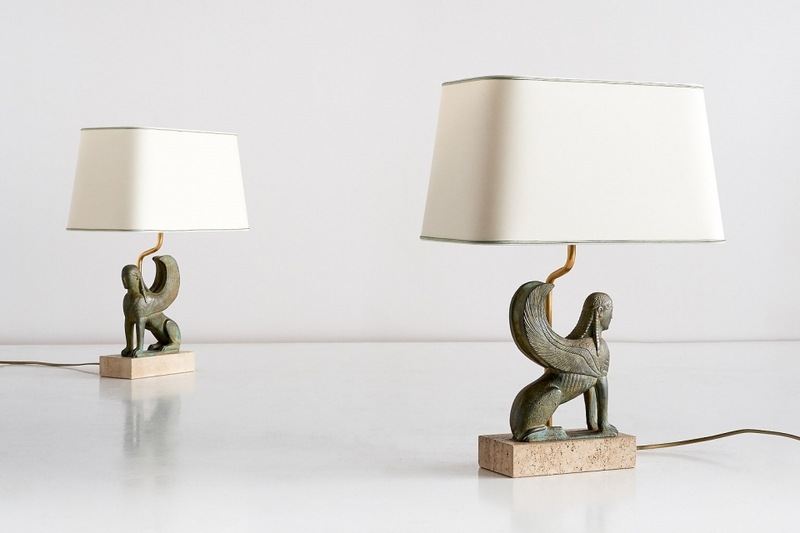 This striking pair of table lamps was designed and produced by Maison Le Dauphin in the 1970s. The intricately decorated golden green ceramic sphinx figures stand on a travertine base. The new ivory shades with a subtly contrasting green trim detail rest on the brass frames. Both bases are marked with “Le Dauphin” labels. Located in Saint-Marcellin, in the region of Dauphiné, the famous French Maison Le Dauphin was created by Maurice Tournu in 1966. Originally specialized in lampshades, it quickly diversified its activities towards the creation and fabrication of decorative lighting. The le Dauphin brand was famous for its stylish and high-end light fixtures in the Hollywood Regency style which was also adapted by other French manufacturers at the time, such as Maison Charles, Maison Jansen and Maison Baguès. Condition: Excellent. Fully functional, wiring has been checked, new shades.